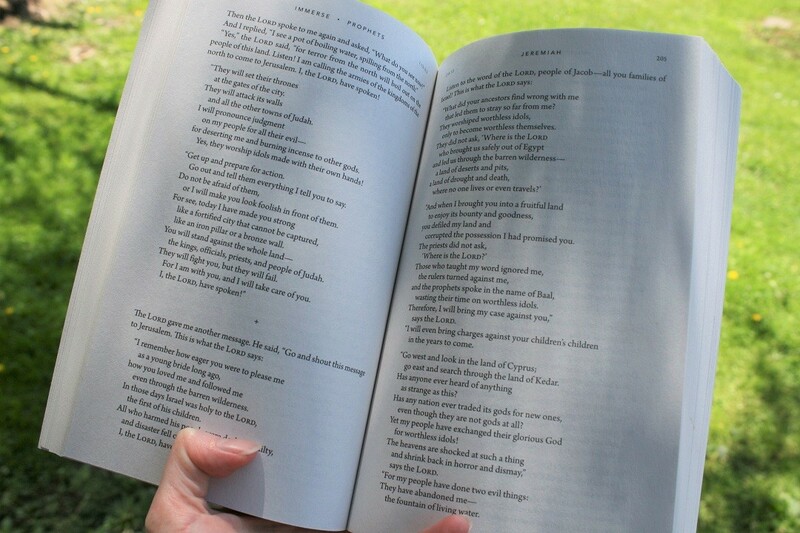 Immerse Prophets is the last book in the Immerse Reading Bible six-volume set. Designed by Glenn Paauw (see Randy’s interview with him here) the purpose of the Immerse Reading Bible is to provide a distraction free, easy to read Bible. 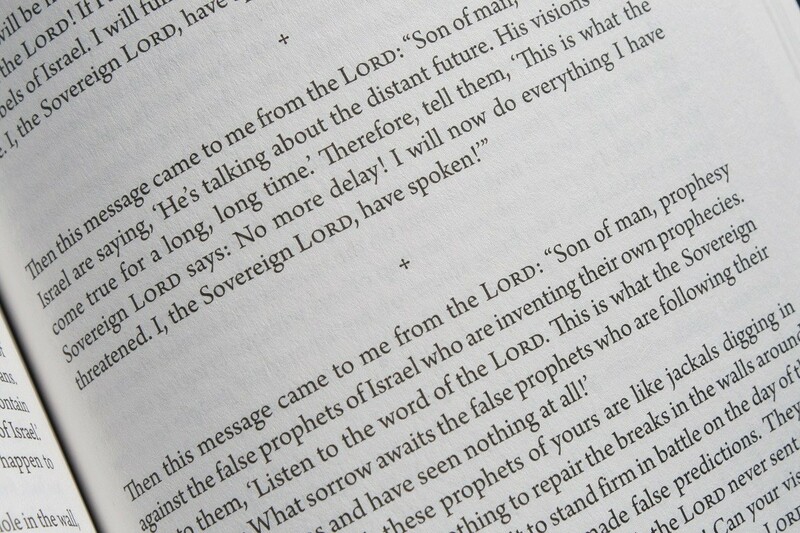 Immerse Prophets contains the remaining 15 books of the Bible. These are grouped in way to generally represent four periods in Israel’s history. There are the four prophets who spoke before the fall of the northern kingdom; Amos, Micah, Hosea, and Isaiah: the three prophets who spoke after the fall of the northern kingdom but before the fall of Judah; Zephaniah, Nahum, and Habakkuk: the three prophets that ministered during Jerusalem’s destruction and while people where being carried to Babylon; Jeremiah, Obadiah, and Ezekiel: and finally the five that represent the prophetic ministry after the remnant of God’s people returned from Babylonian exile; Haggai, Zechariah, Malachi, Joel, and Jonah. If your looking for the 2 missing books grouped with these in a traditional Bible setting the book of Lamentations is in Immerse Poets and the book of Daniel is in Immerse Chronicles. Tyndale provided me with a free review copy. I was not required to give a positive review, only an honest one. All opinions are my own. They intended for these paperback Bibles to feel more like a reading book than a standard Bible. Each book in this series measures 8.5″ x 5.25″ which is right in the range of the size of the larger of the two most common sizes of paperback novels. 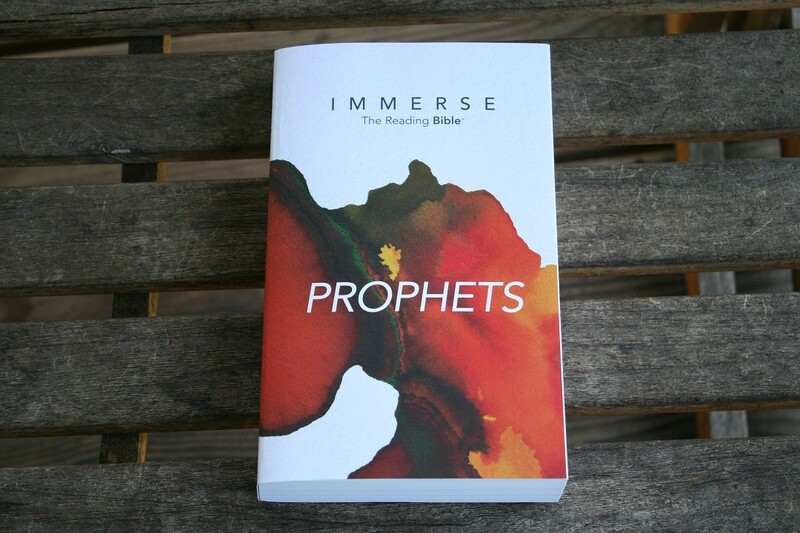 Immerse Prophets is 1.25″ thick and has a glued binding. The paper is very opaque with little show through of the text on the other side of the page. It is a 40# blended sheet with an off-white color and none of the dark flecks in the paper that some newsprint and cheaper paperbacks commonly have. The contrast with the typeface is good, being high enough to read in variable lighting conditions but not so high as to quickly tire your eyes. 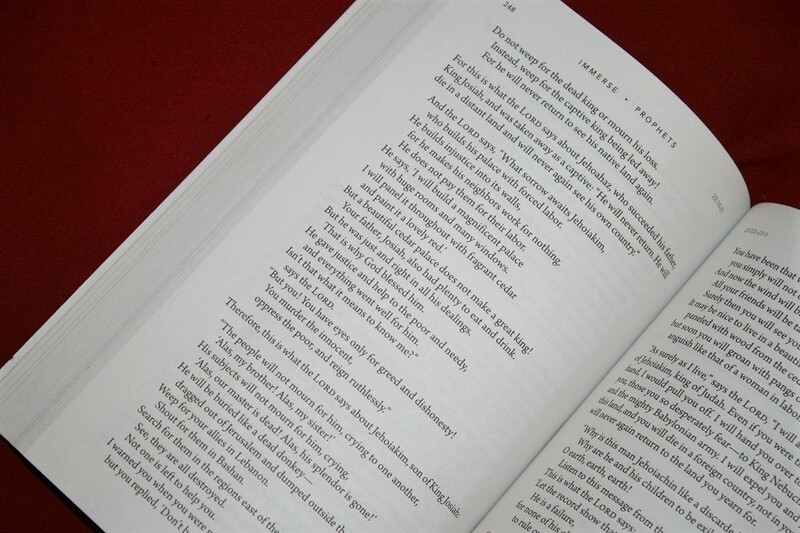 The pages turn easily and the reading experience is very similar to reading a favorite novel. While I like the ebook and paperback formats for familiarity and accessibility I hope Tyndale will consider a hardback or leather bound version of these Bibles in the future. It has a consistently dark black letter text in an Arno Pro font that measures somewhere between 10 & 11 point. There are no chapter or verse numbers. The only indications of where in the book you are at is the guide references found in the header at the inside corner. The header also contains the book name in the center and the page number on the outside corner. Standard text is laid out in single column paragraph format. There are no footnotes or section headings, only single line spaces for minor subject changes and small crosses in the center of a line with a space above and below for complete changes of subject. Poetry is laid out in stanzas and many people used to verse by verse Bibles might be surprised by just of much of the prophetical books are in poetical form. Each book has a 1 to 2 page introduction. These are brief synopses to help you better understand the book you are about to read. They include information about the writer, audience, purpose of writing, date written, major theme and more in a easy to read story format. This introductions have a different font so they are easy to tell apart from the Biblical text. I really enjoyed reading these “Immersed in …” introductions as I thought they did a good job of conveying the setting and tone of the book as well as helping you see the importance of each book. An included card (which is intended to be used as a bookmark) has a quick start guide on one side and a reading plan on the other. 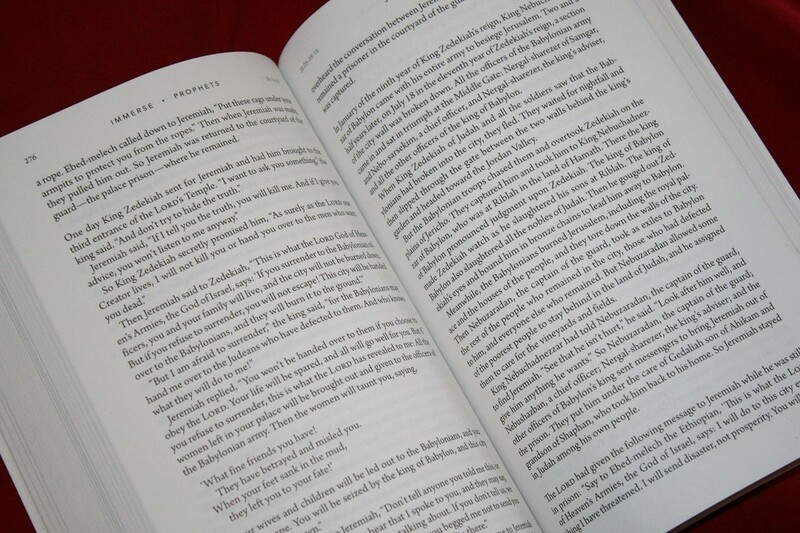 The quick start guide explains 3 ways to get the most out of your reading experience. It also lists resources that are available at ImmerseBible.com. 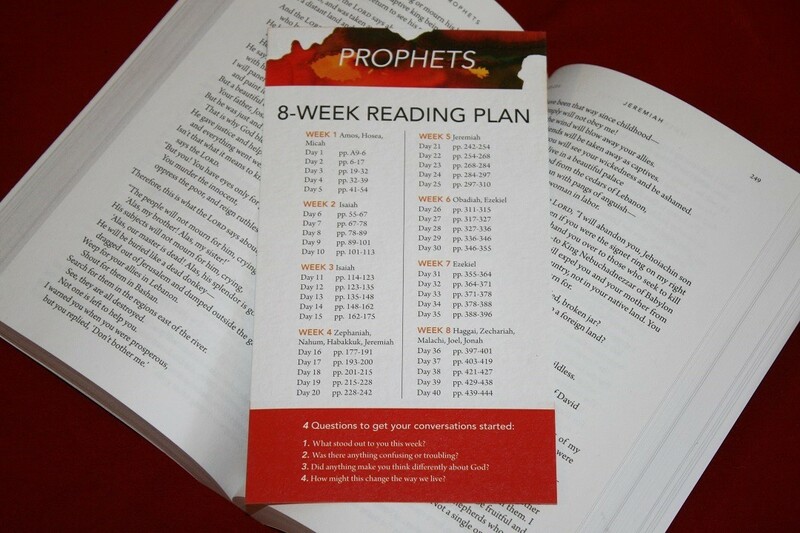 The included reading plan breaks the book into 40 readings designed to be done in 8 weeks with 5 readings per week. There are also 4 questions on this side of the card. These are general questions designed to help you think about what you’ve read and start conversations about it with others. 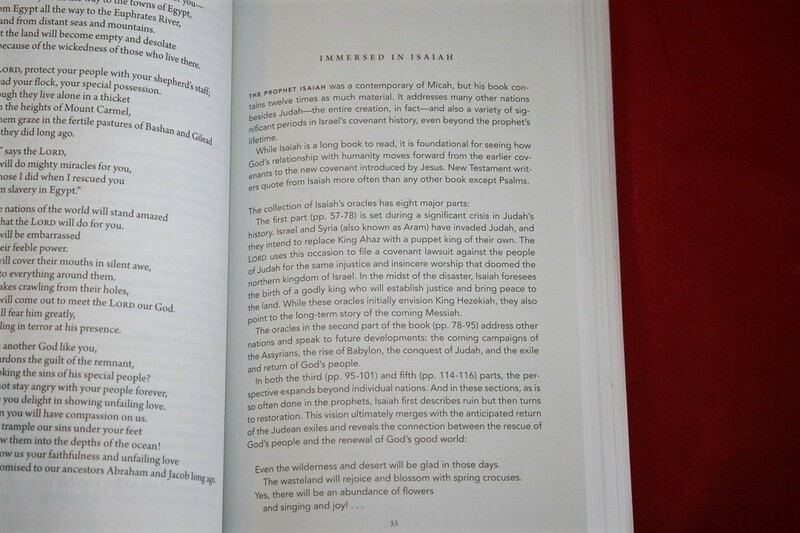 Additional materials within the book include a Table of Contents, a Welcome to Immerse Letter, and an Introduction to Prophets at the front of the book. 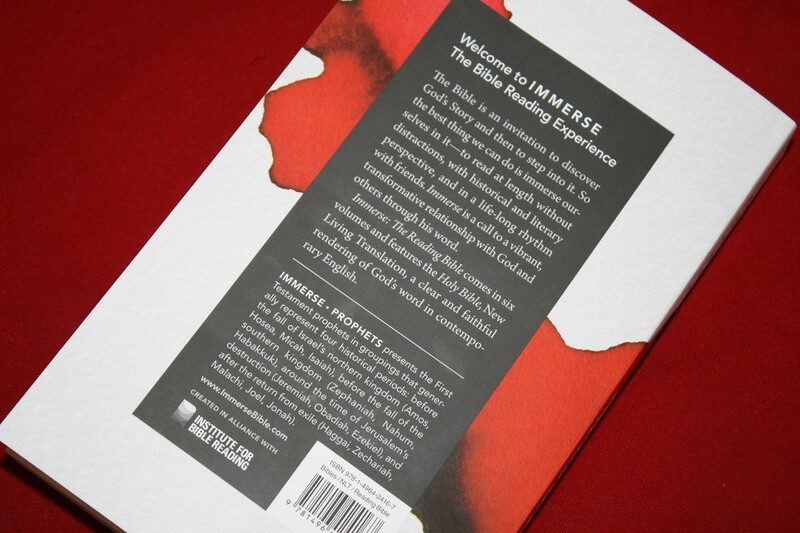 These help you understand the Immerse Reading Bible’s purpose and to quickly find things. A detailed explanation of these can be found in our Messiah review. This volume also includes two black and white maps, one comparing the united and divided kingdoms and one showing the routes for the exile and return under Assyria and Babylon.